Don’t forget, lessons begin September 11, 2017. Looking forward to seeing my students again! If you haven’t already done so, do check out the Student Compositions page. 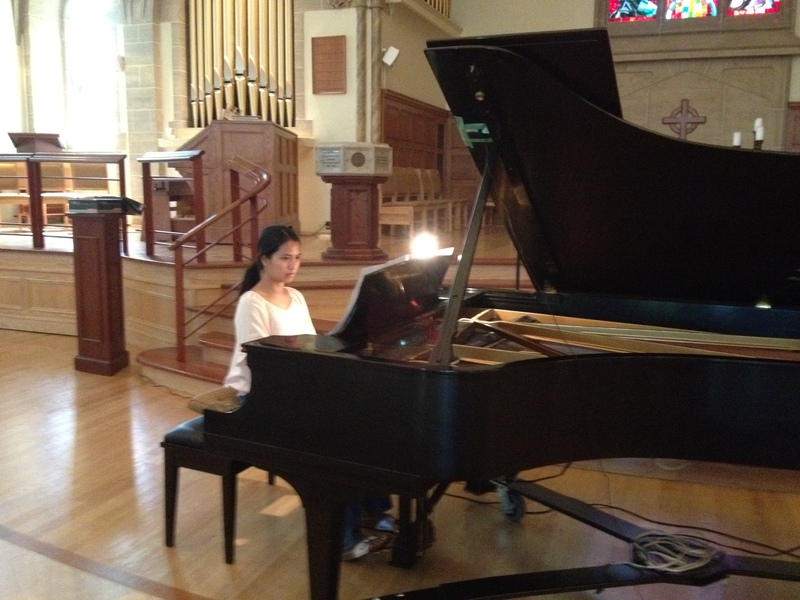 Just recently finished recording Noël Coward’s “Zigeuner” for a short film written and directed by Sara Fenton. It’s called Cupcakes and you should really check it out (see below). The emotion captured in simple gestures really struck me each time I watched it. The online version currently uses a rendition of the song played by Zoltan and His Gypsy Ensemble, with rich tones and dramatic swells accompanying the action’s calm, unaffected pace. The string parts really fill out the visual story, so I was disappointed to discover that the sheet music with vocal and piano parts that I got my hands on resulted in a very thin sound. So, my first unexpected challenge was arranging the piece for solo piano in order to bring out more textures. I’ve only ever arranged very simple short pieces, and I haven’t written anything since undergrad, so I was a bit worried that I didn’t have enough time. I also wanted to do the music and film justice. After a couple of days of Sibelius work (such a great program!) and continual tweaks with each play-through, I finally got a version I was happy with. Turns out, I write music the same way I write papers—I always find some other way to say something, and wonder which option is best. Luckily, there are always deadlines to force me to stop. 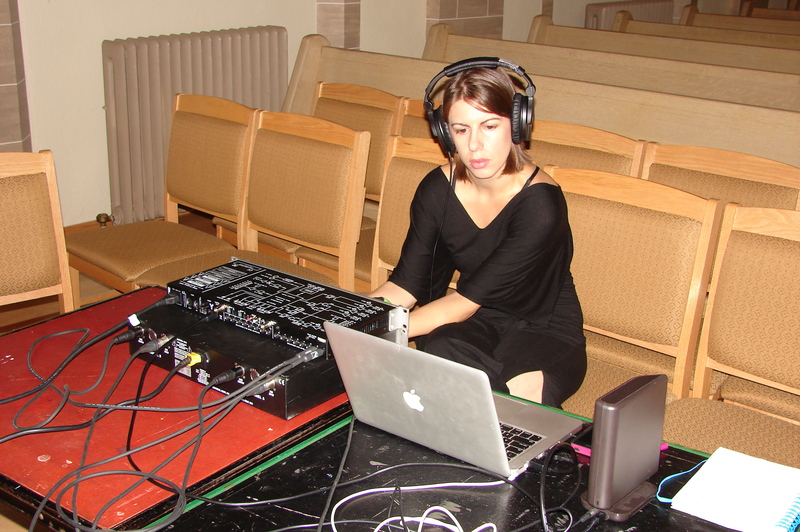 The recording process itself was great new experience— not at all hand-sweat producing, like live playing; surprising to me, because everything is sonically etched for all eternity (or until point of deletion, whichever comes first). 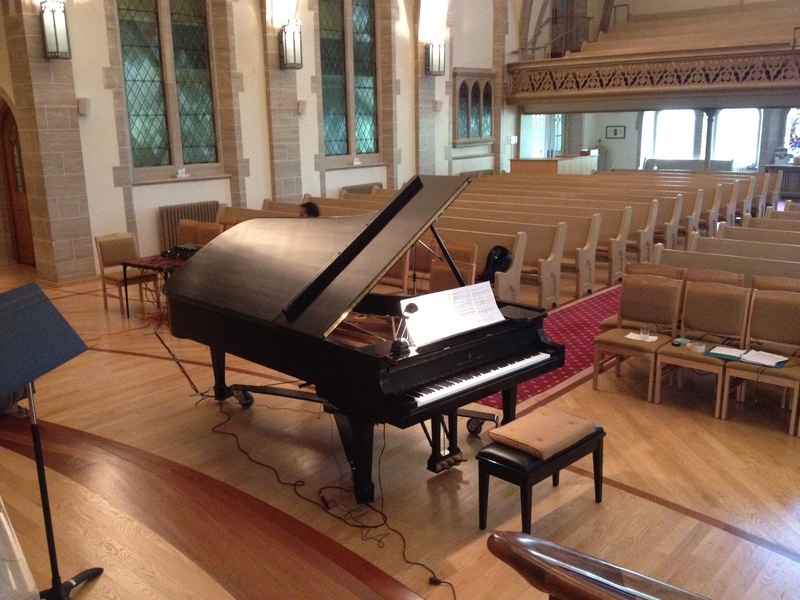 We had use of the Steinway grand at Rosedale United Church, which was a beautiful, calm place to play. After a short warm-up and sound checks, we were off. Since the film had already been cut, the length of the piece needed to be of roughly the same duration. Keeping in mind the right pacing was a challenge. We wanted to keep certain cadences in time with the action, so knowing how much liberty to take with the tempo in order to keep the “schmaltzy” feel within the time constraints sometimes felt like an awkward dance. Like when you’re trying to learn choreography and your elbows and knees keep poking out all wrong. Thankfully, it didn’t end up sounding quite that way, but with each listen I realized I wasn’t allowing space enough for the sounds to peak and diminish naturally. It was a great relief to eventually let go of the sense of the movie’s duration and just play freely. The Steinway had a wonderful full tone, which, though beautiful, definitely changes the atmosphere of the film, to which Zoltan’s version gives a nostalgic crackle. I later listened to the new soundtrack with the movie rolling, and I really liked the resulting expectant and wistful effect. Here’s hoping others like it too. It’s pretty neat hearing your playing against movie scenes. SO COOL! I’ve always known that music changes the perceptual feel of a film, but having a hand in shaping the visual affect allowed me to experience it more palpably—a really enjoyable session. Sara was great to collaborate with. She cared to know what I thought, and liked that no two takes were ever the same. She’s also a dancer, so she understands the connection between movement, space, and sound so well, which is so useful when playing, too. Another plus was that we were on the same page every time! Can’t wait to see the final product. Fill out the Lesson Inquiry Form to ask about available time slots and rates. Another break! So check out the breaks…!